On both occasions, our entry into Mumbai’s newest nightclub and live music venue Blue Frog was preceded by a good deal of confusion. On visit No.1—a private party before the official opening day—a zealous manager stopped us. Only invited guests were allowed, but he forgot to ask if we were invited before telling us we could come back another day. We attributed that to opening day glitches, so went into the 6,000 sq. ft space and downed a couple of cocktails (The Blue Frog, with kaffir lime leaves, Blue Curacao, lemon and vodka, was stunning; the apple martini paled in comparison). The super Afro-Latin band Mango Blue, the acoustics and the design of the club more than made up for the fried starters that came our way (only the crisp Bombay Duck deserves mention). The most talked-about club in Mumbai at the moment is a partnership between a bunch of musicians (Ashutosh Phatak and Dhruv Ghanekar), film-makers (Mahesh Mathai and Srila Chatterjee), an ex-investment banker (Simran Mulchandani), restaurateurs (Rahul and Malini Akerkar) and an MBA (Rishad Nathani). The focus is on live music; while local bands perform on weeknights, the weekends are reserved for international acts. The promoters feel that Mumbai’s music scene is lagging far behind for a global city, so the Frog is a step to make amends. So no pop and Bolly remixes, and we’re grateful for that. By the time we went back a week later, a local tabloid had gleefully reported how a bunch of loud revellers were admonished by the management because the live band was offended by the noise and stepped off stage. “I’m ashamed of Mumbai," the irate promoter announced after the band walked off. It sounded like a new twist to the old play, Insulting the Audience. There was no way we could miss out on what we hoped would be Act II—Patronizing the Patrons. The design of the club—with its high ceilings, two large projection screens and mood lighting—is superior to any nightspot Mumbai currently has. Modern jazz and some Madonna was what we got as we ordered our drinks—a Thai Mojito, with dark rum, caramelized ginger, coriander sprigs and chilli and a Mahiki Treasure Chest, loaded with spiced rum, Bacardi Carta Blanca, brandy, champagne, peach liqueur and lime juice. The mojito, with a large green chilli, was exciting but subtle; it didn’t burn the throat on the way down. The other cocktail was mildly sweet, with warm fruity flavours. After adding these points to The Blue Frog’s, which we had earlier, the bar gets a full score. Another high scorer is the grill. From the bar snacks menu, we tried the Char Grilled German Pork Ribs with a Hoisin jaggery glaze. The meat was tender, with a smear of the sweetish glaze and a subtle smoked flavour. The other accompaniment to our drinks were the Ricotta and Tangerine Tortellini Pot Stickers with Saffron Aioli. The cheese-filled plump parcels were divine, but we detected no tangerine or saffron. From the mains, try the Rawas Fillet Steamed with Galangal and Lemon Grass. It comes with coconut-chilli rice and is steamed in a banana leaf—a Thai version of Patra Ni Macchi. If you’re a cheesecake lover, go for the warm White Chocolate and Cream Cheese Fondant—white chocolate oozes out of a baked cream cheese shell. It was terribly confusing to make sense of the club’s entry charge. An entry of Rs300 for weekdays and Rs800 for the weekends had been decided on. We heard that there would be no entry charge if you come before 8.30pm, but you have to pay if you want to stay after 10.30pm, which is when the band starts. 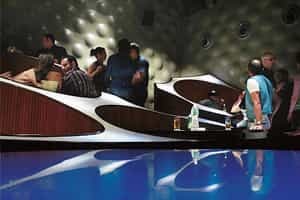 By week two, there were rumours that it cost Rs24,000 to reserve one of the “pods" or sunken seating areas for six to eight which, incidentally, is the only seating in the club (the long bar has no stools). No such charge, we were told when when we called the club to make a reservation. A chatty receptionist booked us a table for two for the 8.30pm dinner seating and advised us to come before 9pm so the cover charge wouldn’t apply. “See, I’m saving you Rs600," she giggled. Even if we stayed beyond 10.30pm, we wouldn’t be asked to pay the entry charge to see the band, she said. The next day she called to confirm the booking and asked if we wanted to keep the table for the second dinner seating as well. “Not required, we’ll move to the bar," we said. She called back a few minutes later to say that the Rs300 would have to be paid if we stayed on after 10.30pm. By this point we had stopped trying to anticipate what the door policy would be. Food-wise, the Duck Breast with Maple, Mustard and Coffee Marinade was a bit disappointing; we tasted no trace of coffee. Cocktails cost between Rs400 and Rs450; a Kingfisher pint is Rs150. The bar snacks are between Rs215 and Rs575, while the first and second courses from the dinner menu average Rs550. Taxes are extra. At the time of going to print, the entry charge is Rs300, on any night.